Andy Robinson has been performing comedy for five years and will continue to do so until he marries into royalty. Andy's foray into the world of stand up comedy began in the early 90's when he played guitar in a band named 'The Carpetsweepers', often leaving both members of the audience in hysterics as his patter between songs gradually became longer and more entertaining than the music. At the Glastonbury Festival in 1993, Andy won a competition for perspiring young comedians. This first encounter of the sweaty world of stand up gave him a real insight into a life of comedy. Andy commenced his meteoric trajectory into the glitzy world of show business from a pub in Dudley where he sharpened his trade compering a 'free and easy' night every fortnight. The discipline of cracking funnies between bare-knuckle boxing and dogfights was an invaluable experience. Andy enjoyed a brief dalliance with the world of local radio where he worked in Birmingham as a DJ, however, matters came to head when some light hearted on air comments about a popular boy band did not correspond with the management's point of view - coincidentally, the station was running a promotional weekend with the aforementioned boy band. He has also written for Virgin radio's breakfast show. Andy also ran a strange hybrid of what he calls "quiz based entertainment" last year at The Glee Club, Britain's largest comedy club outside London. An evening called 'Quizburger' which combined comedy, music, a pub style quiz and theatre. Andy prides himself in the fact that emotions run so high amongst the audience on his 'Quizburger' nights that a fight would inevitably break out every week. 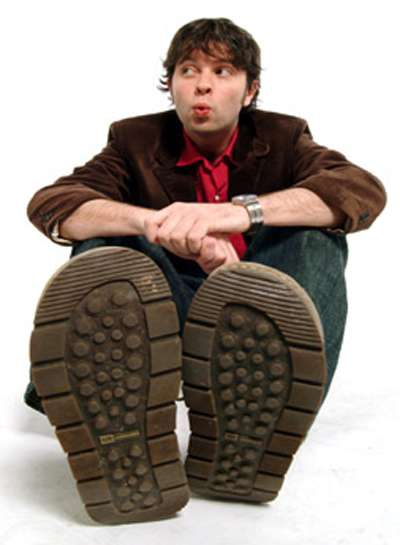 Andy has built up a formidable reputation as a live stand up, having completed four UK tours with + JO BRAND. He has some rather fine jokes to tell as well as a musical element to his act that is different every time.